Personalise your latte or iced cappuccino with Blonde Espresso. BOLD GOAL - We’ll contribute more than one million community service hours each year. Your Starbucks account makes it easy to manage your Starbucks Cards, track your rewards, and get our latest news. 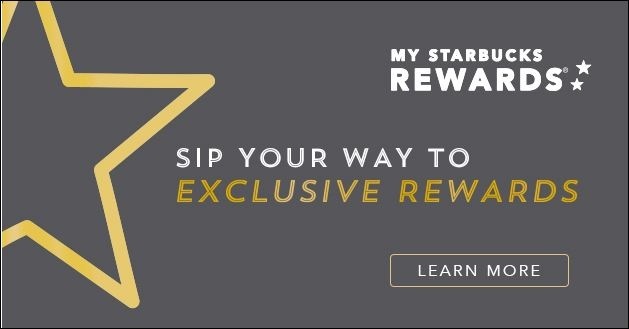 To enjoy free drink rewards, you’ll need to earn Stars. Get one Star when you pay with your registered Starbucks Card at a participating store. Collect more Stars, earn more rewards. Joining is easy. Have a Starbucks Card handy to create an account. Track your Stars online, and we’ll send an email when you’ve earned a reward. We’ll notify you by e-mail when your free drink is ready. Collect 50 Stars within 12 months and you’re at the Gold level. Once you go Gold, keep your Gold benefits for another year by earning another 50 Stars. Get an even bigger boost. Have an extra shot - or more than one - for free. Put a little extra flavour in your drink. Add select syrups for free. Complimentary flavour choices include Caramel syrup, Vanilla syrup (regular or sugar free), Hazelnut syrup (regular or sugar free), Cinnamon syrup, Almond syrup, and Peppermint syrup. Top any drink with a free fluffy cloud of sweetended whipped cream. If your rewards aren't available right away, they'll be ready soon. It can take up to 24 hours to complete a Card registration. To keep your Gold level benefits simply earn 50 additional stars before your anniversary date (the date you qualified for Gold level) and you will continue to enjoy all the Gold level benefits for another year. Otherwise you'll be re-set to the Green level. Visit our FAQ page for more details.